Kleinfleisskees is a small glacier in the Hohe Tauern region in the eastern Austrian Alps. The glacier had an area of 0.87 km2 in 2004 (Binder, 2006). The glacier is located adjacent to the Sonnblick Observatory (3106m), which has both a long term climate record and a webcam.The mass balance of this glacier has been assessed since 1999 (Hynek et al, 2011). From 1999-2012 the glacier has lost 7 m of water equivalent, which is over 8 m of glacier thickness. (WGMS). Unger et al. (2012) produced a map of the changes in this and other nearby glaciers from 1850 to 2009 that was published by WGMS. Here we examine changes in the glacier from 1990 to 2013 using Landsat and Google Earth imagery. Unger et al (2012) Map of glacier change. In each image the red arrow indicates the 1990 terminus and the yellow arrow an outcrop of rock that emerges after 1990. 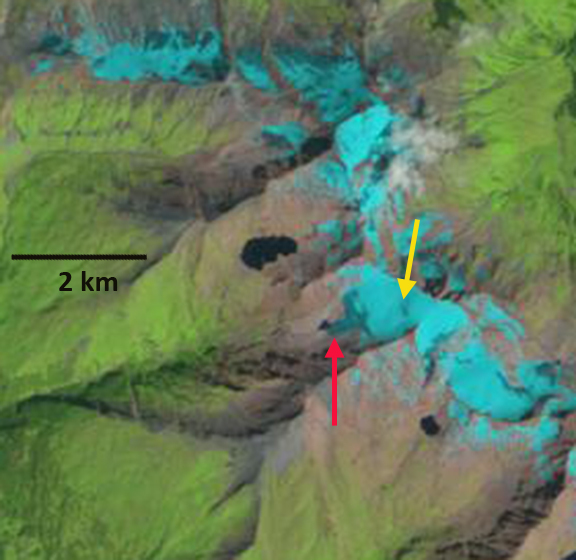 In 1990 the glacier extends to a small lake, red arrow. This terminus tongue is 200 meters wide and 300 meters long. At the yellow arrow the annual snowcover has been lost and glacier ice is exposed. In 2001 the terminus tongue has nearly disappeared and the glacier no longer reaches the lake. 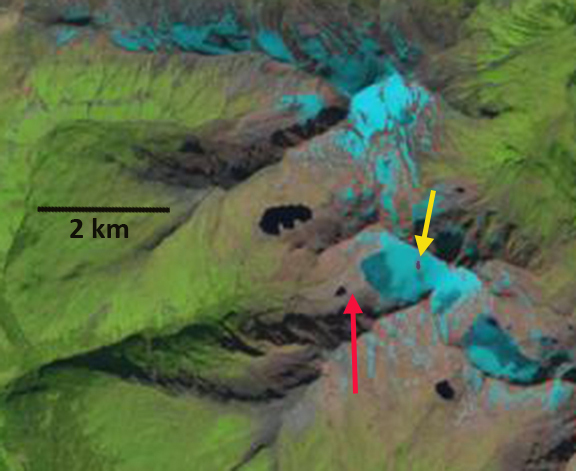 The yellow arrow again indicates a location where snowcover has been lost and a large area of glacier ice exposed, with the hint of bedrock emerging. By 2013 the glacier terminus tongue is gone, the glacier has retreated 400 m from the 1990 position, with most of the retreat occurring by 2005. 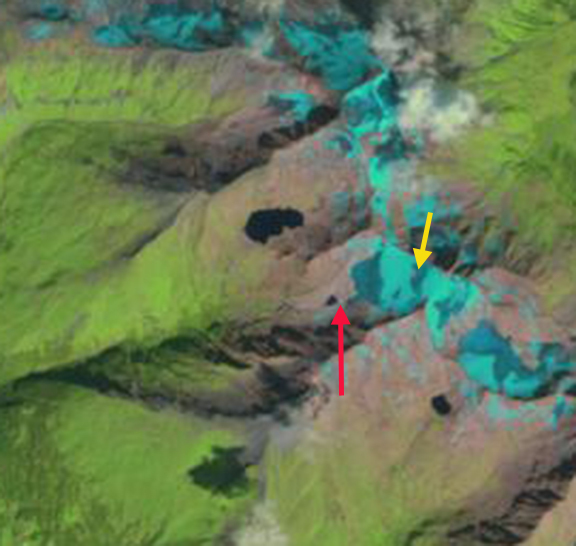 An area of bedrock has emerged at the yellow arrow as the glacier ice covering of this location has been lost. Retreat from 2006-2013 was minor according to the WGMS and the Austrian Alpine Club Inventory. In 2012 this survey found 94 glaciers in retreat and 2 stationary out of 96. In 2012 and 2014 glacier mass balances have been quite negative on the glacier, which will fuel more retreat. 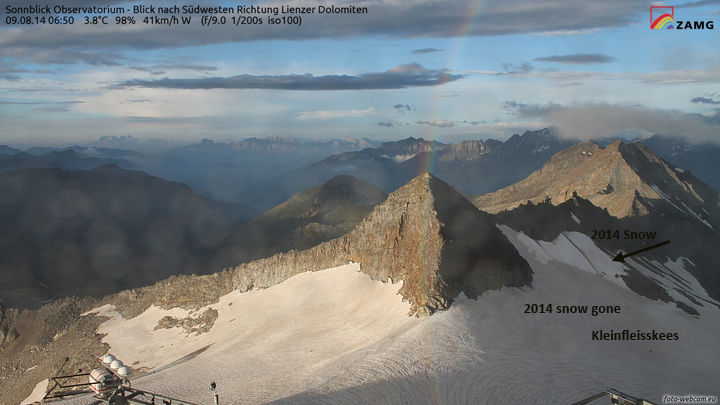 The glacier lost nearly its entire snowpack in 2014 as seen from the webcam at Sonnblick Observatorium on August 9th. Fortunately several late summer snowstorms prevented high ablation after this date. 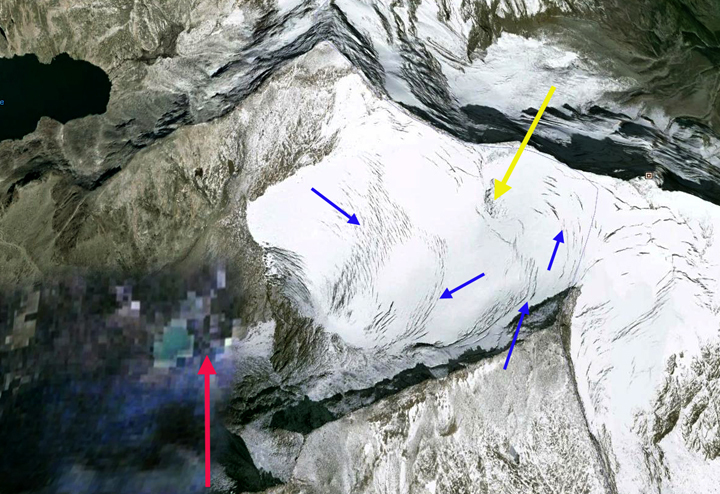 This glacier does continue to have significant crevassing indicating a good flux towards the terminus in the Google Earth image of 2006. The glaciers retreat is similar to that of Hochalm, Oschentaler and Rotmoosferner. Google Earth image from 2006. 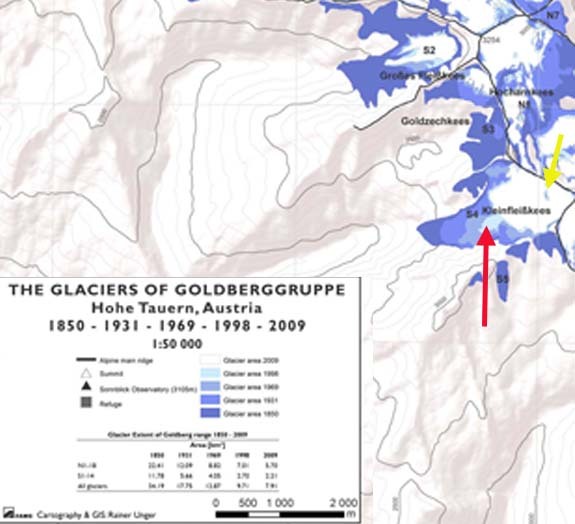 This entry was posted in Glacier Observations and tagged Austria glacier change, Austria Glacier retreat, Kleinfleiss Glacier retreat, Kleinfleisskees retreat. Bookmark the permalink.